We’re celebrating one of our favorite great apes today! These magnificent beauties are intelligent, amazing and closely related to humans! They have one of the longest periods of child rearing in the animal kingdom, because learning to be an orangutan takes time. Unfortunately they are endangered, but we can help! Let’s learn some fun facts and then see how we all can protect these great apes! 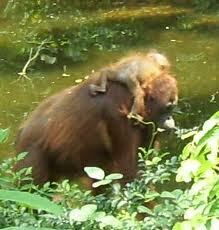 There are two species of orangutans, Bornean and Sumantran. 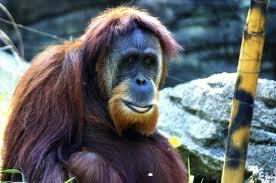 The name Orangutan means man of the forest. Orangutans are arboreal. They spend most of their lives in the trees. Baby orangutans stay with their moms for 8-10 years. They have culture. They share their patterns and behavior with their offspring and others. 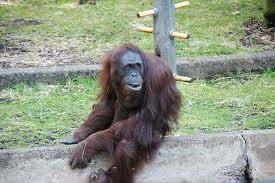 An adult male orangutan has an arm span of about 7 feet. 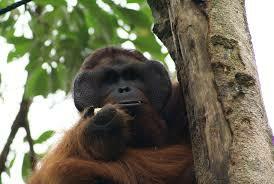 Orangutans build nests in the trees each night. 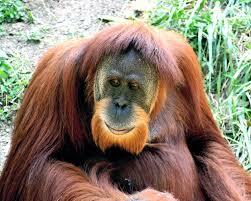 Adult male orangutans develop large cheek pads and throat pouches. We love those faces. Orangutans are losing their precious forest homes due to palm oil plantations. Palm oil is used in many products and food. It is very hard to avoid totally. Cheyenne Mountain Zoo has a wonderful resource for consumers to use. They have a list of products that use palm oil that is produced in a sustainable manner and is not taking over orangutans homes. This resource is a great tool to help orangs! Visiting your local zoo and learning more about these apes is a great way to help! Our local zoo, Zoo Atlanta does some fantastic research with orangutans. They are learning to use computers! Check out the Cheyenne Mountain Zoo website. They even have a nifty app you can take with you when you are shopping! Learn more about Zoo Atlanta’s Orangutan Learning Tree Project! They are doing some amazing work! We’ll be participating in the Redhead Run here in Atlanta to support orangutans too! What a wonderful way to celebrate and help these beautiful creatures.